of Experimental Music, assim se poderia chamar o segundo disco de Soweto Kinch, segundo disco também por aqui comentado deste inglês. 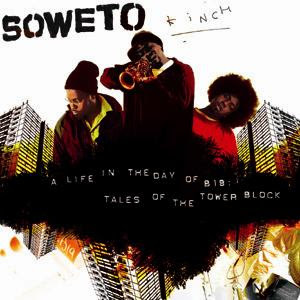 A Life in the Day of B19 - Tales of the Towerblock (2006), é um disco muito... marado. Se não conhecermos Kinch e ouvirmos pela primeira vez este seu registo, poderíamos ser levados a pensar que o inglês havia reunido os seus amigos com o objectivo de tocar jazz e experimentar umas cenas. Se no seu disco de estreia (Conversations with the Unseen, 2003), é facil dizer isto é Jazz!, neste Tales of the Towerblock, seria errado fazer um juízo semelhante. Porque erradamente simplista. Ok, tudo bem, o background é jazz: baixos, trompete, guitarras, bateria, sax. Mas esperem... o que é aquele rap todo? Ou aquelas conversas non-sense? E aqueles sintetizadores estranhos? Pois! Se no seu disco anterior, só havíamos ouvido Kinch a rappar em momentos pontuais tendo o sax como expressão predominante, neste segundo registo, o músico pousa mais vezes o seu intrumento de eleição e dedica-se à arte da spoken word. No rap mais clássico, mas também no freestyle. E ainda (!) no beatbox (Everybody raps). A Life in the Day of B19 - Tales of the Towerblock tem, a meu ver, o seu quê de surrealismo. Quer no rap de Kinch, quer na atmosfera sonora, há momentos de puro delírio. Esoterismo aos montes. Veja-se neste sentido as faixas 10.30 Appointment, Ridez, Padz, So! e Who Knows. Jazz mais tradicional em The Mission, Adrian's Ballad (esplêndida! ), Marcus's Crisis, A Friendly Game of Basketball (adoro este título! ), The House that Love built (e este!). O cruzamento de tons electrónicos e do hoje tão explorado breakbeat exponenciam ainda mais o ambiente quase-alucinado do reportório. Ouvir este disco é uma viagem. Uma experiência de sons e imagens. Apertem os cintos! British saxophonist Soweto Kinch polarised opinion to the max in 2003, with his jazz 'n' hip-hop debut, Conversations With The Unseen (Dune). Many older listeners hated it, regarding it as a betrayal of tradition of Judas-like proportions. Younger, more inclusive listeners loved it, welcoming it as, simultaneously, a reconnection with jazz's long-lost roots in urban street culture and a way forward into a brighter and more vigorous future. The battle lines weren't wholly characterised by age and anticipated prejudice, however. The great, conscious rapper KRS-One loved Kinch's music and gave him a support slot on tour. More surprisingly, perhaps, Wynton Marsalis professed to like it too. The New York Times, admittedly not the newspaper of choice for most rap fans, thought Kinch could teach the US a thing or two about narrative rap. And the album picked up a string of awards, the most prestigious of which was Album Of The Year in the Mercury Music Prize. A Life In The Day Of B19: Tales Of The Towerblock, is likely to fan the flames of dispute even harder. As Kinch has it, Conversations was concerned with taking hip-hop to the jazz audience, while B19 is about taking jazz to the hip-hop audience. There is, consequently, an even closer focus on rap, narrative and jazzoetry, alongside more of Kinch's visceral, high octane take on post bop. Kinch's core quartet—bassist Michael Olatuja, guitarist Femi Temowo, drummer Troy Miller, and the leader on saxophones and keyboards—bring together such diverse influences as Charlie Parker, Ornette Coleman, Stevie Wonder, Charles Mingus and Duke Ellington with energy and high style. It's all, very nearly, a major masterpiece. And there's more to come. B19 ends with one of the characters finding something unexpected and dramatic in the basement (we're not told what). Next spring, Kinch will release part two of the story, Basement Fables, and we'll find out whether that something is a path to danger or a path to salvation—or neither, or both. Whatever it turns out to be, bring it on.